The Antibody Society is pleased and proud to be affiliated with mAbs, a multi-disciplinary journal dedicated to advancing the art and science of antibody research and development. We hope you enjoy these brief summaries based on the abstracts of the most read papers published in recent issues. All the articles are open access; PDFs can be downloaded by following the links below. The “less-is-more” in therapeutic antibodies: Afucosylated anti-cancer antibodies with enhanced antibody-dependent cellular cytotoxicity. In this new review, Pereira et al. discuss the relevance of antibody core fucosylation to antibody-dependent cell-mediated cytotoxicity, and different strategies to produce afucosylated antibodies, and provide an update of afucosylated antibody drugs currently undergoing clinical trials, as well as those that have been approved. A long non-coding SINEUP RNA boosts semi-stable production of fully human monoclonal antibodies in HEK293E cells. Sasso et al. report the results of their study of SINEUP technology applied to semi-stable production of monoclonal antibodies in HEK293E cells. SINEUP RNAs are long non-coding transcripts, possessing the ability to enhance translation of selected mRNAs. The authors propose SINEUP technology as a valuable tool to enhance semi-stable antibody production in human cell lines. Prediction of non-linear pharmacokinetics in humans of an antibody-drug conjugate (ADC) when evaluation of higher doses in animals is limited by tolerability: Case study with an anti-CD33 ADC. Figueroa et al. present a practical approach that uses limited pharmacokinetic (PK) and receptor occupancy (RO) data of the corresponding unconjugated antibody to predict ADC PK when conjugation does not alter the non-specific clearance or the antibody-target interaction. Their findings showed that, for a cytotoxic ADC with non-linear PK and limited preclinical PK data, incorporating RO in the PK model and using data from the corresponding unconjugated antibody at higher doses allowed the identification of parameters to characterize monkey PK and enabled human PK predictions. Linear pharmacokinetic parameters for monoclonal antibodies are similar within a species and across different pharmacological targets: A comparison between human, cynomolgus monkey and hFcRn Tg32 transgenic mouse using a population-modeling approach. In this report, Betts et al. used population-pharmacokinetic (popPK) modeling to determine a single set of ‘typical’ popPK parameters describing the linear PK of mAbs in human, cynomolgus monkey and transgenic mice expressing the human neonatal Fc receptor (hFcRn Tg32), using a rich dataset of 27 mAbs. Translational strategies were investigated for prediction of human linear PK of mAbs, including use of typical human popPK parameters and allometric exponents from cynomolgus monkey and Tg32 mouse. Each method gave good prediction of human PK with parameters predicted within 2-fold. These strategies offer alternative options to the use of cynomolgus monkeys for human PK predictions of linear mAbs, based on in silico methods (typical human popPK parameters) or using a rodent species (Tg32 mouse), and call into question the value of completing extensive in vivo preclinical PK to inform linear mAb PK. When monoclonal antibodies are not monospecific: Hybridomas frequently express additional functional variable regions. Bradbury et al. discuss results of their study, which analyzed 185 random hybridomas, in a large multicenter dataset, to determine the genetic diversity in antibody heavy chain and light chain genes found within individual hybridomas. Of the hybridomas evaluated, 126 (68.1%) contained no additional productive chains, while the remaining 59 (31.9%) contained one or more additional productive heavy or light chains. The expression of additional chains degraded properties of the antibodies, including specificity, binding signal and/or signal-to-noise ratio, as determined by enzyme-linked immunosorbent assay and immunohistochemistry. Their findings, reflecting the current state of hybridomas used in research, reiterate the importance of using sequence-defined recombinant antibodies for research or diagnostic use. Evaluation of analytical similarity between trastuzumab biosimilar CT-P6 and reference product using statistical analyses. In this report, Lee et al. 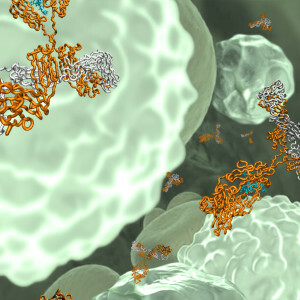 evaluated analytical similarity of CT-P6, a biosimilar product of trastuzumab, with the reference products (EU-Herceptin® or US-Herceptin®) following risk-based statistical approaches recommended in a recent US Food and Drug Administration guideline for the risk-based statistical approaches recommended by the US Food and Drug Administration. Various quality attributes of trastuzumab were first ranked based on the clinical impact of each attribute and subsequently adjusted to one of three tiers (Tier 1, Tier 2 and Tier 3) considering the characteristics of the assay, the level of attribute present and the feasibility of statistical analysis. Analytical similarity assessment analyzed by the three tiers clearly demonstrated that CT-P6 exhibits highly similar structural and physicochemical properties, as well as functional activities, compared with the reference products. Analytical and functional similarity of Amgen biosimilar ABP 215 to bevacizumab. Seo et al. report the results of their analytical similarity assessment, which was designed to assess the structural and functional similarity of ABP 215 and bevacizumab sourced from both the United States (US) and the European Union (EU). Similarity assessment was also made between the US- and EU-sourced bevacizumab to assess the similarity between the two products. More than 20 batches of bevacizumab (US) and bevacizumab (EU), and 13 batches of ABP 215 representing unique drug substance lots were assessed for similarity. The large dataset allows meaningful comparisons and garners confidence in the overall conclusion for the analytical similarity assessment of ABP 215 to both US- and EU-sourced bevacizumab. The structural and purity attributes, and biological properties of ABP 215 are demonstrated to be highly similar to those of bevacizumab. Like this post but not a member? We encourage you to join the Society to take advantage of the substantial benefits of membership, including discounts on fees for selected KNect365, CHI, and Hanson Wade meetings, discounted subscriptions to Society-affiliated journals PEDS and mAbs (special subscription rate of US $84 online only access for Antibody Society members) and access to information in the Members Only section of the website. In particular, we encourage members to take advantage of the discount on registration for Antibody Engineering & Therapeutics, which is the annual meeting of The Antibody Society traditionally held in San Diego in December. Membership is free for students, post-docs and employees of our corporate sponsors! The US Food and Drug Administration has approved Amjevita® (adalimumab-atto) as a biosimilar to Humira® (adalimumab). In adult patients, Amjevita® is approved for moderately to severely active rheumatoid arthritis; active psoriatic arthritis; active ankylosing spondylitis (an arthritis that affects the spine); moderately to severely active Crohn’s disease; moderately to severely active ulcerative colitis; and moderate to severe plaque psoriasis. Amjevita® is also indicated for moderately to severely active polyarticular juvenile idiopathic arthritis in patients four years of age and older. Amjevita® is the third antibody-based drug to gain approval as a biosimilar in the US this year. Inflectra® (infliximab-dyyb), a biosimilar to Remicade® (infliximab), was approved in April 2016 and Erelzi® (etanercept-szzs) , a biosimilar to Enbrel® (etanercept), was approved in August 2016. The number of antibody-based biosimilar therapeutics approved in the European Union or United States is poised to grow substantially in 2016 and 2017. The originator products that target tumor necrosis factor (TNF) have been of particular interest to the biosimilar industry due to the expiration of key patents and the large global markets for the products. In 2013, the three top-selling originator anti-TNF products were infliximab (Remicade®), etanercept (Enbrel®) and adalimumab (Humira®), which combined had global sales of nearly $18 billion that year. The first biosimilar anti-TNF products approved in either the EU or US were Inflectra® and Remsima®, both of which are versions of infliximab. Inflectra® and Remsima® were approved in the EU in September 2013 for rheumatoid arthritis, Crohn’s disease, ulcerative colitis, ankylosing spondylitis, psoriatic arthritis, and psoriasis. While no antibody-based biosimilar products were approved in either the EU or US in 2014 or 2015, two products have been approved in each of these regions so far in 2016, and more may be approved soon. In the EU, the biosimilar etanercept BENEPALI® was approved in January 2016 for moderate to severe rheumatoid arthritis, psoriatic arthritis, severe ankylosing spondylitis, severe non-radiographic axial spondyloarthritis, and plaque psoriasis, and the biosimilar infliximab Flixabi® was approved in May 2016 for rheumatoid arthritis, Crohn’s disease, ulcerative colitis, ankylosing spondylitis, psoriatic arthritis, and psoriasis. In the US, Inflectra® was approved in April 2016 for the treatment of moderately to moderately to severely active rheumatoid arthritis, severely active Crohn’s disease, moderately to severely active ulcerative colitis, active ankylosing spondylitis, active psoriatic arthritis, chronic severe plaque psoriasis, and the biosimilar etanercept Erelzi® was approved in August 2016 for moderate to severe rheumatoid arthritis, moderate to severe polyarticular juvenile idiopathic arthritis, active psoriatic arthritis, active ankylosing spondylitis, and chronic moderate to severe plaque psoriasis. A biosimilar adalimumab (ABP-501) may be approved soon, as the Food and Drug Administration’s (FDA) Arthritis Advisory Committee voted unanimously to support approval of it in July 2016. The product was recommended for the treatment of rheumatoid arthritis, juvenile idiopathic arthritis in patients aged 4 years and older, psoriatic arthritis, ankylosing spondylitis, adult Crohn’s disease, adult ulcerative colitis, and plaque psoriasis. Although the FDA does not release comprehensive lists of products in review, the European Medicines Agency (EMA) does provide limited information on applications for centralized marketing authorization under evaluation. As of August 3, 2016, a total of 6 applications for biosimilar adalimumab (3 applications), etanercept (1 application), and the anti-CD20 rituximab (2 applications) were under evaluation. In late August, EMA also accepted for review a marketing authorization application for a proposed biosimilar trastuzumab, which is used to treat certain HER2-positive breast and gastric cancers. Thus, there may soon be as many as 11 biosimilar antibody-based therapeutics on the market in the EU, and many of these could also gain approval in the US.